Creating effective survey questions ensures that the survey response rate is genuine and effective. Since our clients are spread all across the globe, we have made it a point to ensure that designing the survey questionnaire is an easy task for people of all regions. When asking a date question, consider the common practices of writing a date among your survey audience. Understanding and clarifying expectations will help to improve your data. If you are surveying participants in one area, you may select the MM-DD-YYYY or DD-MM-YYYY formats. This will help participants to provide an exact, accurate response to your date type question. If you plan to launch your survey in multiple countries, you may opt for the Drop Down format for date. This will help to clarify for participants what each item stands for. 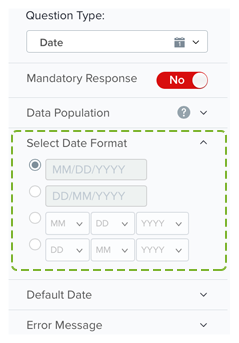 You can also pre-populate Date questions with the current date or any specific date to help participants better understand the format of providing responses. This question type allows you to set an expected format to improve data quality. 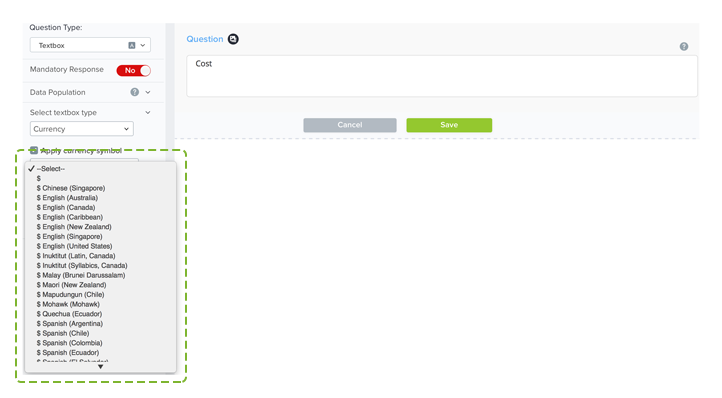 For example, the preceding screenshot displays a question that requests participants to provide the cost of a product in Dutch (Netherlands) currency. Similarly, based on your country, you may append a currency symbol, while adding this question in your survey. You can also ask your respondents to provide their Social Security Number so that the question automatically validates the SSN provided. A Demographics Question is a great time saver. It helps to capture personal details of a respondents, such as name, email address, phone number, and more. Instead of creating many text boxes manually, simply add the sub-questions of the Demographics Question. You can also format this question, depending upon the location of your participants, whether there are from the US or any other country.